If Jesus were standing right next to you, what question would you as him? How would he measure greatness? In today’s Gospel reading, Jesus explains the meaning of true discipleship. But he might as well have been teaching college algebra. A short time after the 9/11 attacks in 2001, a radio producer who had been living in Brooklyn began traveling around the country to learn what was really important to Americans. She interviewed hundreds of people, and asked them the same three questions: What do you live for? What would you die for? What would you kill for? Kori Hays, our youngest biblical storyteller, tells James 3:1-12. How great a forest is set ablaze by a small fire! And the tongue is a fire. The tongue is placed among our members as a world of iniquity; it stains the whole body, sets on fire the cycle of nature, and is itself set on fire by hell. For every species of beast and bird, of reptile and sea creature, can be tamed and has been tamed by the human species, but no one can tame the tongue– a restless evil, full of deadly poison. With it we bless the Lord and Father, and with it we curse those who are made in the likeness of God. From the same mouth come blessing and cursing. My brothers and sisters, this ought not to be so. Does a spring pour forth from the same opening both fresh and brackish water? Can a fig tree, my brothers and sisters, yield olives, or a grapevine figs? No more can salt water yield fresh. These few lines of scripture, known as The Great Commission, are the basis for The WAY, a new adult class coming to SSSJ. The WAY focuses on what Jesus taught and how we live this today. The WAY is a process—a time when we will read scripture, talk about things, pray together, and share how God fits into our lives. The WAY is not about Church dogma; it is not about what you must believe. It begins at St. Simon & St. Jude on Sunday evening, October 7th. I hope that through The WAY, we will each speak more confidently about what it means to be a mature disciple of Jesus Christ and how our daily lives are shaped by our faith. The idea of creating a course for daily discipleship is not new to us at St. Simon & St. Jude. More than a decade ago, several committed lay members of the parish started an adult discipleship program called “Pilgrims in Christ.” The idea was that Christianity spread in ancient times by the profound enthusiasm and witness of the Church’s members, not by the teaching and preaching of the clergy. Christianity was caught, not taught. Through the efforts first of a few individuals, then more as they were trained, we began to see that the best way to reach out to the community was to begin by reaching in to our own members and teaching what it means to be a modern disciple. After a few years, we became known as parish full of engaged and motivated disciples and our mission and ministry grew. Since that time, we’ve had several changes in clergy leadership, as well as a fresh influx of new people. Still, “making disciples” is really what the Church all about. My hope is that by building on the wisdom and experience of those former “Pilgrims,” and by adding the fresh perspectives of the many who have joined us over the past several years, The WAY will become the heart of a renewed sense of our mission and ministry in the world. Stage I—Inquiry (October to Thanksgiving). This stage is open to anyone and is intended to introduce the general ideas that we will be exploring. We will share our faith stories and listen for how God is acting in our lives. Stage II—Formation (Advent to Epiphany). This stage is open to anyone and is intended to be a more focused time of inquiry. We’ll study how Baptism, as expressed in the Baptismal Covenant, shapes our daily lives. Stage III—Preparation (Lent). This stage is for those who have decided to make a commitment either to be baptized or to renew their baptismal vows. We’ll look at the commitments and practices necessary to develop a deeper relationship with Jesus Christ through study, prayer and fellowship. Former Pilgrims—We need your experience and your support as teachers and mentors. Please consider this as an opportunity to renew your own discipleship calling by helping others on their journey. Baptized members of SSSJ—For those of you who were, like me, baptized many years ago as a small child, please consider this an opportunity to reexamine the vows that were made on your behalf at your baptism. For those of you who were were baptized as an adult, perhaps this is an opportunity for more intentional consideration of your baptismal calling. In either case, my hope is The WAY will lead to a fervent renewal of your baptismal vows. For newcomers and those who are simply trying to understand what this is all about—this course will be an excellent time for you to “come and see.” You’ll get to know other members of the congregation while learning what we believe as Episcopalian Christians. For those not yet been baptized, my hope is that your journey on The WAY will lead you to consider formalizing your relationship with Christ through the waters of baptism at the Easter Vigil next spring. We also need volunteers to prepare meals for the class on Sunday evenings. Through the many excellent articles in this issue of On the Way, you will find several different descriptions of discipleship. But this passage from Acts portrays the oldest glimpse of what life was like among the disciples. It remains the clearest description of what we aspire to be as a church. The Apostles’ Teaching. Jesus taught the apostles to be evangelists and teachers. 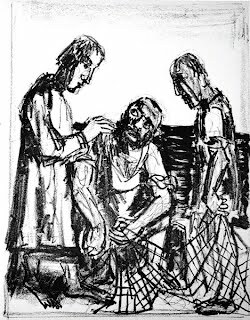 Jesus Calling Peter, by German painter and printmaker Otto Dix (1891-1969), from “Glocal Christianity,” the blog of Matt Stone. We, too, are called to go out into the world proclaiming by our words and our actions that God is alive and living in the world today, and to teach others how to become actively engaged in God’s saving plan for the world right here and now. We are a community of evangelists, teachers, and learners. The Fellowship or Common Life. We are called to be a community of love and support for our own members, a community where we spend time with each other, where we see each other more than every once in a while on a Sunday morning, where we all share in the joys and achievements, the sorrows and disappointments of one another. We are called to be a community that enjoys being with one another. 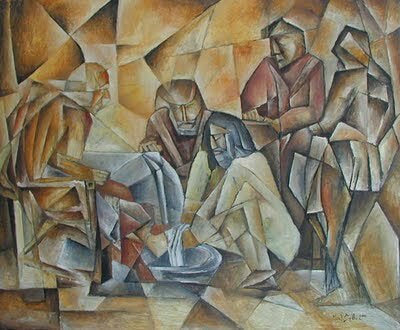 The Breaking of the Bread and the Prayers. We called to worship together and pray for each other on a regular basis, and to share in the sacraments through the liturgy. We are a community where our our understanding of a “worship service” is how we serve God through our offering of ourselves through praise and thanksgiving. Sharing All Things in Common. We are called to serve the community of Irmo and the world through our outreach ministries. We share our time, talent, and treasure with all those who need help, as we are able to do so. This, in a nutshell, is what The WAY is all about. Please consider joining me on the journey. No matter how many times I read the story of Jesus and the Syrophoenician woman, I can’t help but think that Jesus wasn’t being very Christ-like when he compared the Syrophoenician woman to a dog. But before she was able to get his blessing, she had to take Jesus to school.